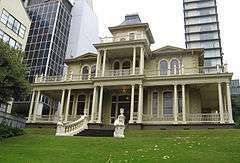 Antrim House of Wellington, New Zealand, was completed in 1905 for Robert Hannah (1845-1930) and his wife Hannah Hannah (1852-1928). The manor was named after the original owner/builder's home county of Antrim, Northern Ireland though the style in which the house was executed in served more to the then popular eclectic mix of Victorian/Edwardian Italianate. Features of the structure corresponded to the earlier tastes for Queen Anne and Second Empire styles, as seen in the heavy interior cornices, the original though lost upper iron detailing and the central tower. The structure itself is mainly of kauri and heart totara, lying on concrete foundations. Until the leaving of the Hannah family from the residence, Antrim served as exactly as intended: a fine display of not only taste but also the wealth of a self made man. The central location served to highlight this, while the original garden on the sloping site in front of the house helped to enhance the features and the property itself. Inside, one found gas piping, electric light and the most modern convenience of a piped bathroom. Paired with pressed Zinc ceilings, stained glass lead lighting and turned features, it epitomised what was considered both modern and high taste. With the Hannah family departing the house in the 1930s, its central location and size worked against it. The house had fallen from fashion, and subsequently became a boarding house – a fate that many grand houses in urban areas have shared. During this time, the building suffered its largest ignominy – the fire of 1940. Features that had survived the departure of the Hannahs were now lost to this – and in reconstruction much of its decorative originality was not replaced: two examples are the asymmetry of the originally symmetrical windows on top of the tower, and the oddly placed Art Deco styled arch above the formal stair. Later the house was owned by New Zealand Historical Places Trust, Heritage New Zealand. The organisation has both restored features of this now rare town residence, and it is currently their central office. What was once a site bordered by other homes in now encased by Post Modern structures. The building is classified as a "Category I" ("places of 'special or outstanding historical or cultural heritage significance or value'") historic place by Heritage New Zealand. ↑ "Antrim House". Register of Historic Places. Heritage New Zealand. Retrieved 2009-12-21. Wikimedia Commons has media related to Antrim House.